Fans of Eleanor & Park and The Book Thief will love this startling and heart-warming take on Peter Pan. Seventeen-year-old Kettle has had his share of adversity. As an orphaned Japanese American struggling to make a life in the aftermath of an event in history not often referred to--the internment of Japanese Americans during World War II and the removal of children from orphanages for having "one drop of Japanese blood in them"--things are finally looking up. He has his hideout in an abandoned subway tunnel, a job, and his gang of Lost Boys. Desperate to run away, the world outside her oppressive brownstone calls to naïve, eighteen-year-old Nora--the privileged daughter of a controlling and violent civil rights lawyer who is building a compensation case for the interned Japanese Americans. But she is trapped, enduring abuse to protect her younger sister Frankie and wishing on the stars every night for things to change. For months, they've lived side by side, their paths crossing yet never meeting. But when Nora is nearly killed and her sister taken away, their worlds collide as Kettle, grief stricken at the loss of a friend, angrily pulls Nora from her window. World War II is over, but community feelings toward Japanese Americans still run high, and two very different teens are struggling to live in the aftermath. Seventeen-year-old Kettle has been an orphan living on the streets for years, working the docks when he can and trying to care for other street children alongside his brother, Kit. Nora, on the other hand, is the daughter of a wealthy, big-name civil rights lawyer, but that does not protect her from his violent beatings behind closed doors. Existing side by side without knowing it, Kettle and Nora's paths cross one night, and suddenly everything changes. Lyrically written, this powerful and at times painful read captures the reader and does not let go. Told in alternating chapters from the two characters' perspectives, their respective narratives cross and intertwine, drawing Nora and Kettle closer until they finally unite. Parallels to Peter Pan and Wendy provide motif and depth without overwhelming the reader. Firmly rooted in the history of internment camps and racial prejudice, this remarkable novel educates subtly while focusing on themes of home, acceptance, courage, and the danger of secrets. --Melissa Moore "Booklist - Starred "
Lauren Nicolle Taylor is the bestselling author of THE WOODLANDS SERIES and the award-winning YA novel NORA & KETTLE (Gold medal Winner for Multicultural fiction, Independent Publishers Book Awards 2017). 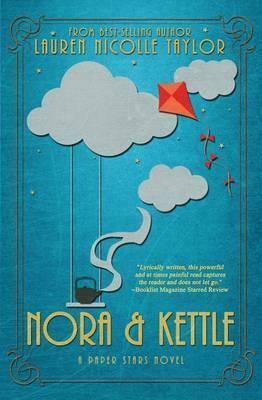 NORA & KETTLE received a starred review from Booklist magazine. She has a Health Science degree and an honors degree in Obstetrics and Gynecology. She is a proud Hapa, living in the lush hamlet of the Adelaide hills with her husband and three children.